Lake Palace : There are at least three reasons to visit Pichola Lake located on the outskirts of the city. The most obvious one is Lake Palace, a super-luxury hotel and island of exotica slap bang in the middle of its tranquil waters. At dusk, the ambience cast by the play of golden light on creamy white marble takes you back 300 years, to when this royal abode was built by Maharana Jagat Singh. Its courtyards, pillaried terraces, ornate fountains and beautiful gardens, not to mention suites, are jaw-dropping. Beware: On moonlit nights, they say Cupid never misses his mark, so careful who you check in with! Voted one of the most romantic hotels in the world and fit for a king-size wallet! Definitely our top pick. City Palace : This is your second reason to visit Pichola Lake. On its eastern bank, stroll down a royal memory lane at this palatial complex that exhibits an intriguing mix of Rajasthani, Mughal, European and Chinese architecture. Like any royal palace worth its name, this one too has towers, pavilions, cusped arcades, cupolas, hanging gardens and courtyards. Its many regal rooms boast delicate mirror work, mosaics, miniature paintings, inlay work and royal paraphernalia on display. The complex is sprawling and soaking it in is all in a day’s work. The entry fee is steep but it puts on quite a display. Jag Mandir : The third reason Pichola Lake is exciting to visit is Jag Mandir. Located on one of the two natural islands in Pichola Lake (the other is Lake Palace), Jag Mandir (Maharana Jagat Singh dedicated a temple to Lord Jagdish on the premises) was the summer refuge of the royals 450 years ago. Yes, even the Maharanas of Mewar needed a summer resort! Enter through a pavilion flanked by elephants and feel like royalty. When you arrive at Gul Mahal, revel in a tidbit of history. This is where Emperor Shah Jahan was granted asylum by the Rajputs when he rebelled against his father, Emperor Jehangir, while still a prince. Spend a few minutes at the museum detailing the history of the island and collect a few more royal gems. And, oh yes, this makes for a stunning sunset point. Note : Boats are available from the jetty next to City Palace to all these destinations. Fateh Sagar Lake : If you’ve got a royal hangover after Pichola, Fateh Sagar will soon set you right. There isn’t any real sightseeing to be done here – but that’s just the point! Encircled by gentle hills and graced by a beautiful, long and twisting promenade, this is the perfect getaway from all things touristy. Hit ‘refresh’ by taking a leisurely morning stroll along the water’s edge and you’re good to go. After that, take a boat ride from Moti Magri Hill to to Nehru Park in the middle of the lake, where an invigorating, hot cup of coffee in the restaurant is all you need. Those who still like to read, can take a book along. Nirvana is only an autoriskshaw ride away from Udaipur city. Rajsamand Lake : If you have a private vehicle, ink this one into your itinerary. Better still, if you’re on your way to Kumbhalgarh Fort or Kumbhalgarh Wildlife Sanctuary, take a short detour, for this is a milestone you don’t want to miss. At the risk of sounding repetitive – but it must be said anyway – the Rajsamand Lake shore is a pretty page from the past. The southern embankment sports marble terraces that melt into the water. There are also five toranas (weighing arches) where, during a festival called Tuladan, kings used to weigh themselves in gold and then distribute it among Brahmans. Take the time to look at the beautifully carved pavilions here. They are sculpted with images of the Sun, chariots, gods, birds and other splendid carvings. And get this – the history of Mewar is inscribed in 1017 stanzas, on 27 marble slabs. Not to be missed! Located 66 km north of Udaipur. Jaisamand Lake : Till the Aswan Dam in Egypt was built, Jaisamand Lake (aka Dhebar Lake) was arguably the largest artificial lake in Asia. Appropriately, it was a lake fit for kings and queens, for set in its embankments like gemstones are palaces of Rana Jai Singh (who lent his name to the lake) and his queen. The summer palaces of the queens of Udaipur also grace its shores. Here, marble steps unfurl like a spotless white skirt down to the water’s edge while the courtyards offer a dazzling view of the lake. A must-visit if you have the time and transport. Located 48 km south-east of Udaipur. Wildlife & Excursions : When you’ve had your fill of Udaipur’s lakes, clamber onto higher ground. Udaipur, like much of Rasjasthan, is visited by a variety of migratory birds and resident fauna too abounds. It’s a myth that natural reserves are meant for birdwatchers and animal lovers, No, it’s not about the thrill of the chase. For just a few hours, let the enchanted wood strike a spiritual chord. 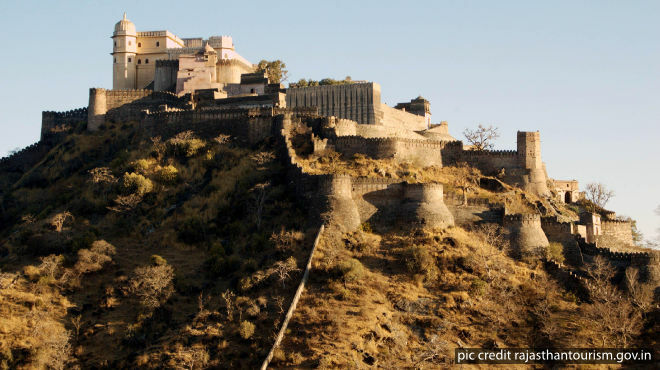 The sanctuary borders the mighty and impressive Kumbhalgarh Fort. It’s towering, massive, and yawning fortifications have earned it the moniker ‘Great Wall of India’. Note: Check the season before you visit these sanctuaries. Also, they are too large to navigate on your own, so take a jeep safari. Fairs & Festivals : The Mewar Festival is celebrated in March-April, and heralds spring. It coincides with the festival of Gangaur. Both festivals are marked by colourful ceremonial processions that wend their way across Udaipur while a boat procession starts at the Lake Palace. The mood is joyful and the whole city is awash with colour. Planning a tip during this time is highly recommended. Shilpgram Crafts Festival is a delight for crafts lovers. Shilpgram is situated 3 km from Udaipur, and showcases the crafts of various communities from Rajasthan and other Indian states. Held during November-December.